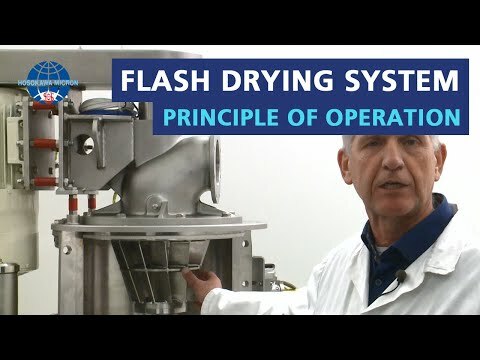 Flash drying refers to the removal of moisture by a stream of hot gas that goes through a stream of small particles that moves in the opposite direction. When drying large quantities of bulk powders, it can be important to better control the output characteristics of the powder. For this, combining drying, milling and classifying steps in one piece of equipment can be beneficial. The Micron Dryer flash dryer, Drymeister® (DMR-H) from Hosokawa, can dry temperature-sensitive products, safely, even under increased temperatures, in a matter of seconds. Process parameters like classifier speed and outlet temperature can be adapted to control moisture content and particle size of the end product. The drying system is very flexible, handling moisture content fluctuations from a few % up to more than 80% in suspensions, slurries, pastes, dough, filter cakes and wet powders. The Drymeister® requires 75% less space and uses about 30-40% less energy per kilogram of evaporated water than conventional methods. The Flash combine drying system can be used in different industries such as food industry, chemical industry with applications in products such as pesticides, inorganic pigments and fish feed.